The deep blue waters of the Indian Ocean lap the red sands of the ‘north’ as the West Coast Explorer winds its way north from Fremantle to Dampier. 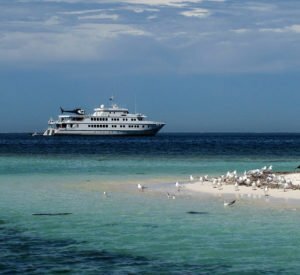 The Abrolhos are steeped in history; Ningaloo boasts world-acclaimed marine life and the Montes offer fishing paradise – the ‘West Coaster’ is a sojourn that tames Australia’s still-wild western shores! A must for snorkelers and divers, a must for fishers, a must for the adventurer at heart! Your adventure begins in the Perth – capital of the sprawling state of Western Australia. Occupying the entire western third of the Australian continent, Western Australia is Australia’s largest state but despite its vastness, the state has just 2.3 million inhabitants representing only 10% of the nation’s population. The capital is a modern and vibrant city featuring many attractions; in fact Perth was ranked eighth in The Economist’s 2010 list of the World’s Most Liveable Cities. Not a bad starting point for your adventure on the ‘still wild west coast’. 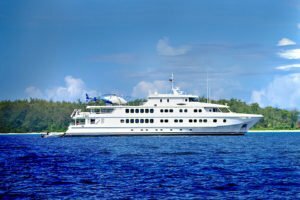 Join your fellow adventurers on-board the magnificent TRUE NORTH for a welcome aboard cocktail party and the first of many sumptuous dining experiences as we begin the overnight cruise to the Abrolhos Islands. 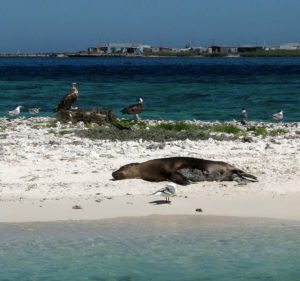 The Houtman Abrolhos are a chain of 122 islands and associated coral reefs lying some eighty kilometres due west of Geraldton. They are the southernmost true coral reef in the Indian Ocean and one of the highest latitude reef systems in the world. 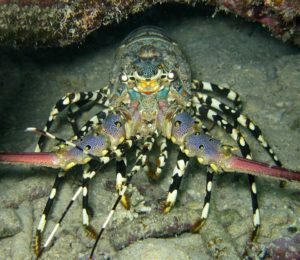 They are also one of the world’s most important seabird rookeries and the centre of Western Australia's largest single species fishery, the Western Rock Lobster Fishery. The islands have a small seasonal population of fishermen and they are well known as the site of numerous shipwrecks, the most famous being the Dutch ships Batavia, which was wrecked in 1629, and Zeewijk, wrecked in 1727. Stretch your wings early and join a heli-flight featuring stunning reef formations and intriguing island communities. Or join a snorkelling tender - shallow inshore lagoons provide comfortable snorkelling midst colourful coral and a myriad of fish species. Curious sea lions frequently join in the fun. Or perhaps wet line! As well as being the 'home' of Western Australia’s delectable rock lobster - the Abrolhos is also renowned for its fishing. 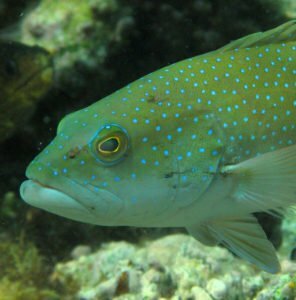 Fine eating species such as Westralian jewfish, groper, snapper, and coral trout are commonly caught and, with your assistance, will likely adorn the ship’s menu. Another alternative might be a scenic cruise in one of our comfortable adventure boats. Step ashore and find a bird-watching paradise. On the beach the honeymooning oyster catchers are hard to miss - they never leave each other’s side. In the dunes button quails and crakes nest under the dry vegetation and unique to the Abrolhos are the lesser noddys - beyond the shores of Australia, their only other nesting location is in the Seychelles. 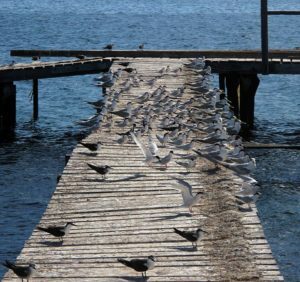 Thousands of migratory birds use the islands as a pit stop on their arduous journey across the globe. Greenshanks, godwits, sandpipers, knots and stints decorate sparkling white beaches, roseate, crested and sooty terns fish the blue water and ospreys build giant nests wherever they can. Then enjoy a leisurely cruise to the Easter Group. Upon arrival the snorkelling and fishing boats will be away again, dive the "Anemone Patch" and walk amongst the intriguing shacks on Rat Island. The Houtman Abrolhos – so named to warn mariners to “keep a sharp look-out”, but the fate of the Dutch East-Indian merchantman Batavia was sealed long before her hapless crew could take heed. In the dark of night the Batavia struck an unforgiving Abrolhos reef and so began a terrifying sequence of events overshadowed by desertion, betrayal, murder and revenge! In 1628 the newly built Batavia sailed from Holland bound for the Dutch East Indies. It sailed under the command of Francisco Pelsaert, with Ariaen Jacobsz serving as skipper. Also on board was junior merchantman Jeronimus Cornelisz, a bankrupt pharmacist from Haarlem who was fleeing the Netherlands in fear of arrest because of his heretical beliefs. During the voyage, Jacobsz and Cornelisz conceived a plan to take the ship and after leaving Cape Town, Jacobsz deliberately steered the ship off course. On 4 June 1629 the ship struck a reef near Beacon Island. Of the 322 aboard, most of the passengers and crew managed to get ashore, although 40 people drowned. An initial survey of the islands found no fresh water and only limited food (sea lions and birds). Pelsaert realised the dire situation and decided to search for water on the mainland. A group comprising Captain Jacobsz and Pelsaert left the wreck site in a 9m longboat in search of drinking water. After a fruitless search, they abandoned the other survivors and headed north in a danger- fraught voyage to the city of Batavia (now known as Jakarta). This journey, which ranks as one of the greatest feats of open-boat navigation, took 33 days and, extraordinarily, all aboard survived. After their arrival in Batavia, Jacobsz was arrested for negligence, although his position in the potential mutiny was not guessed by Pelsaert. In order to rescue the others and, to salvage the Batavia’s valuable cargo, Batavia’s Governor General immediately gave Pelsaert command of the Sardam. He arrived at the islands two months after leaving Batavia, only to discover that a bloody mutiny had taken place amongst the survivors. Jeronimus Cornelisz, who had been left in charge of the survivors, was well aware that if the water party ever reached the port of Batavia, Pelsaert would report the impending mutiny. Therefore, he made plans to hijack any rescue ship. Cornelisz’s first deliberate act was to have all weapons and food supplies commandeered and placed under his control. He then moved a group of soldiers, led by Wiebbe Hayes, to nearby West Wallabi Island, under the false pretence of searching for water. They were told to light signal fires when they found water and they would then be rescued. Convinced that they would be unsuccessful, he then left them to die. Cornelisz then had complete control and the remaining survivors faced two months of unrelenting butchery and savagery. Between them, his followers murdered at least 110 men, women, and children. Although Cornelisz had left the soldiers to die, they had in fact found good sources of water and food on their islands. Initially, they did not know of the barbarity taking place on the other islands and sent the pre-arranged smoke signals. However, they soon learned of the massacres from survivors who managed to flee Cornelisz’ island. The soldiers put together makeshift weapons made from materials washed up from the wreck and, they built two small forts out of limestone and coral blocks. Cornelisz seized on the news of water on the other island – his own supply was dwindling and the continued survival of the soldiers threatened his own success. He went with his men to try and defeat the soldiers marooned on West Wallabi Island. However, the trained soldiers were by now much better fed than the mutineers and easily defeated them in several battles before Pelsaert returned. Pelsaert seized the mutineers – the worst offenders were executed. Some were abandoned on the mainland and the rest were taken to Batavia. A board of inquiry later decided that Pelsaert had exercised a lack of authority and was therefore partly responsible for what had happened. His financial assets were seized and he died a broken man within a year. On the other hand, the common soldier Wiebbe Hayes was hailed a hero. The Dutch East India Company promoted him to sergeant, and later to lieutenant, which increased his salary fivefold. Of the original 341 people on board Batavia, only 68 made it to the port of Batavia. In circumstance that could not be more contrasting - discover for yourself the fate of the Batavia. Snorkel and dive in the crystal clear waters of the wreck site. Go ashore at Beacon Island and see a remarkably preserved canon lying in shallow water. Visit Long Island where mutineers were hanged. At the end of the day it will be hard not to reflect on such tragic circumstance! Join the adventure boats for a day of fishing, snorkelling and diving. Nearby Fish Point has been known to produce coral trout in shallow water and we know some spots out- wide that are pretty reliable when it comes to fine eating species such as jewfish. Fish Point and the Turtle Bay shallows are also perfect for an easy snorkel and dive sites in the area include "Planet Channel" and other spots that feature some excellent overhangs and caves. Step ashore at West Wallaby Island for a glimpse of the reclusive tamar wallaby and join our guides for a scenic walk amongst the ruins of Wiebbe Hayes’ rudimentary 'forts'. Start the day with an exhilarating hike to Steep Point – the western most edge of the Australian continent. 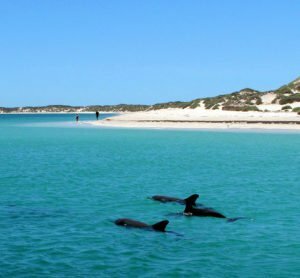 Steep Point is part of the Shark Bay World Heritage area and is widely regarded as one of the finest land- based game fishing locations in the world. 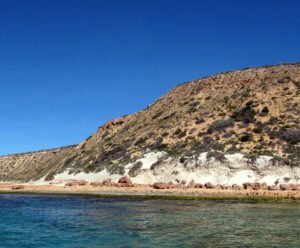 With the Zuytdorp Cliffs to the south, and spectacular views of South Passage to the North and East, Steep Point is also surrounded by some of the most breathtaking Western Australian scenery. The cliffs rise vertically from sea level to 170 metres and the photographers onboard will cherish opportunity to capture the drama of the Indian Ocean crashing against the Australian continent. Heli-flights over the Zuytdorps will provide stunning views of this spectacular coast. South Passage is another hot-spot for those keen on fishing and hopefully the divers will see the giant gropers that frequent “Monkey Rock”. And nearby Dirk Hartog Island is the site of the first ever European landing on Australian soil. This 80 kilometre long island was discovered on the 25th of October 1616 by the Dutch sea captain Dirk Hartog, who was blown off course while sailing in the Dutch East Indies Trading Company ship Eendracht from Cape Town to Batavia. Hartog inscribed a pewter plate with his name and the date and left it nailed to a tree. In 1697 the Dutch captain Willem de Vlamingh landed on the island and discovered Hartog’s plate. He replaced it with one of his own, which included a copy of Hartog’s inscription, and took the original plate home to Amsterdam, where it is still kept in the Rijksmuseum. In 1801 the island was visited by a French expedition led by Captain Emmanuel Hamelin aboard the Naturaliste. This expedition found de Vlamingh’s plate almost buried in the sand, its post having rotted away. The Captain ordered that it be re-erected in its original position. Then, in 1818 the French explorer Louis de Freycinet, who had been an officer in Hamelin’s crew, visited in the Uranie. He sent a boat ashore to recover de Vlamingh’s plate. It eventually arrived in Paris, only to be lost for over a century. It was found in 1940 and returned to Australia in 1947, where it can now be seen in the Western Australian Maritime Museum in Fremantle, Western Australia. In 1869, Francis Louis von Bibra established sheep on the island and traded guano from its bays. Perth Lord Mayor Sir Thomas Wardle purchased the island as a private retreat for his family in 1969 and later retired there, becoming a semi-recluse with his wife. With the exception of the pastoral homestead, the island later returned to government ownership and became part of the Shark Bay Marine Park. It is now run as an eco-tourism resort and maintained by Wardle’s grandson, Kieran Wardle. All will be unable to resist the pristine beaches that skirt the island’s southern end. Swim, snorkel or just take a relaxing stroll along a coast that likely still looks and feels as it did in 1616! 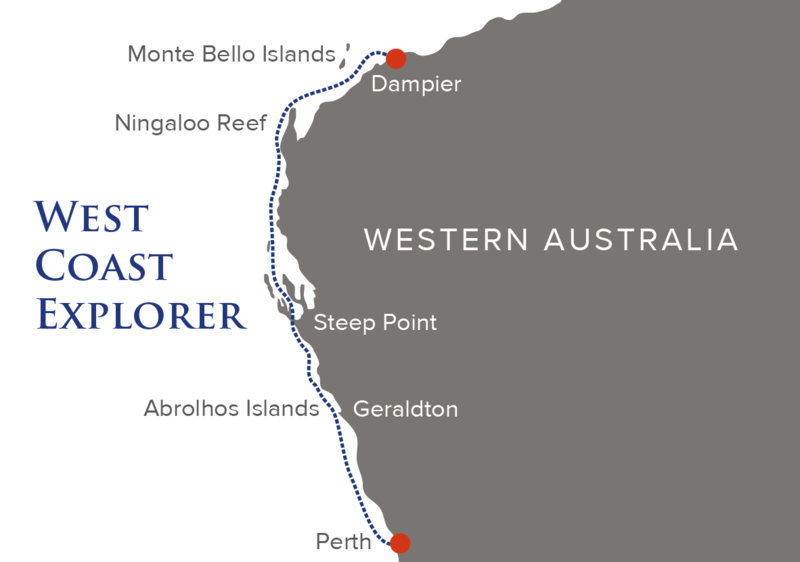 This morning the TRUE NORTH will cruise to Cape Inscription on the northern tip of Dirk Hartog Island. The fishing and snorkelling tenders will be away again and there will also be an opportunity for a dive on the western side of the Cape. Those interested in history might prefer to join the shore parties. Tide permitting, our guides will lead you to the very spot where Hartog left his pewter plate. The ship’s helicopter will explore Hartog from the air and the sheltered waters off Turtle Bay will provide another opportunity for a dive. There will also be ample opportunity for leisurely swims and island beachcombing. 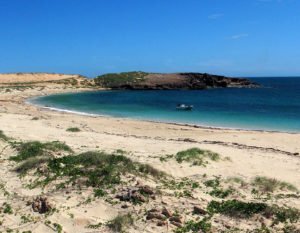 Ningaloo Reef is one of West Australia’s most popular tourist destinations and as soon as you step onto one of its brilliant white beaches you will see why! Stunning fish and corals occur within metres of the shoreline - no special skills needed here - just a mask will reveal all in swimming pool like conditions! 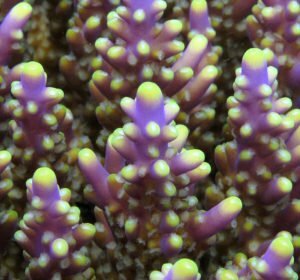 The reef is 260 km long and is Australia’s largest fringing coral reef and the only large reef positioned very close to a landmass. The reef is less than half a kilometre offshore in some areas. In 1987 the reef and surrounding waters were designated as a marine park. Although most famed for its whale sharks, the reef is also rich in coral and other marine life. The reef is included in the migratory routes of dolphins, dugongs, manta rays and humpback whales. The adjacent beaches are also important rookeries for loggerhead, green and hawksbill turtles. They also depend on the reef for nesting and food. Ningaloo supports an abundance of fish (500 species), corals (300 species), molluscs (600 species) and many other marine invertebrate. In 2006, researchers discovered gardens of sponges that are thought to be species completely new to science. The day will be spent discovering the many bays and shallow inner reef areas of this acclaimed coral habitat. We’ll also squeeze in some light game fishing for the tenacious mackerel and visit the settlement at Coral Bay. Wake this morning somewhere completely different - the intriguing Montebello Islands. The Montes are an archipelago of 174 small islands lying 130 kilometres off the Pilbara coast of north- western Australia. The islands have a collective area of about 22 square kilometres. They consist of limestone rock and sand and they are predominantly covered in hummock grasses and scattered shrubs. Patches of mangrove grow in the sheltered bays and channels of the archipelago. The two main islands, Hermite and Trimouille were discovered by the French explorer Nicolas Baudin in 1801 and the group attained economic significance for pearl fishing from the end of the nineteenth century until the outbreak of the Second World War. But real infamy came more recently in October 1952 when Trimouille Island was the site of Operation Hurricane, the first British nuclear weapons test. There were two further tests on Alpha and Trimouille Islands in 1956. The second of these, codenamed G2, was the largest device ever detonated in Australia, with a yield of 98 kiloton. Contamination from this test reached Queensland on the other side of the Australian continent. Even more recently the Montes have developed a reputation as island paradise with seemingly endless opportunities for fishing, snorkelling and diving. Day two at the Montes. Commence proceedings with an early morning fish or join the ship’s naturalist when the adventure boats head ashore for beachcombing and bird-watching - the islands have been identified by BirdLife International as an Important Bird Area (IBA) because they support over 1% of the world populations of Fairy Terns, Roseate Terns, and Sooty Oystercatchers. Greater Crested Terns also breed, sometimes in large numbers and other breeding species include ospreys, white-bellied sea-eagles, pied oystercatchers, caspian terns and bridled terns. The islands also support a small number of breeding beach stone-curlews. The ship’s helicopter will again provide a unique perspective whilst the snorkellers and divers hunt for giant crayfish. After lunch perhaps there will be an opportunity to stalk the mangroves for a Montes mud crab and not forgetting an island favourite – the delectable whiting might also make it to the menu. Spend the afternoon on the beach or head out for another dive – the Montes will live up to its reputation as island paradise! 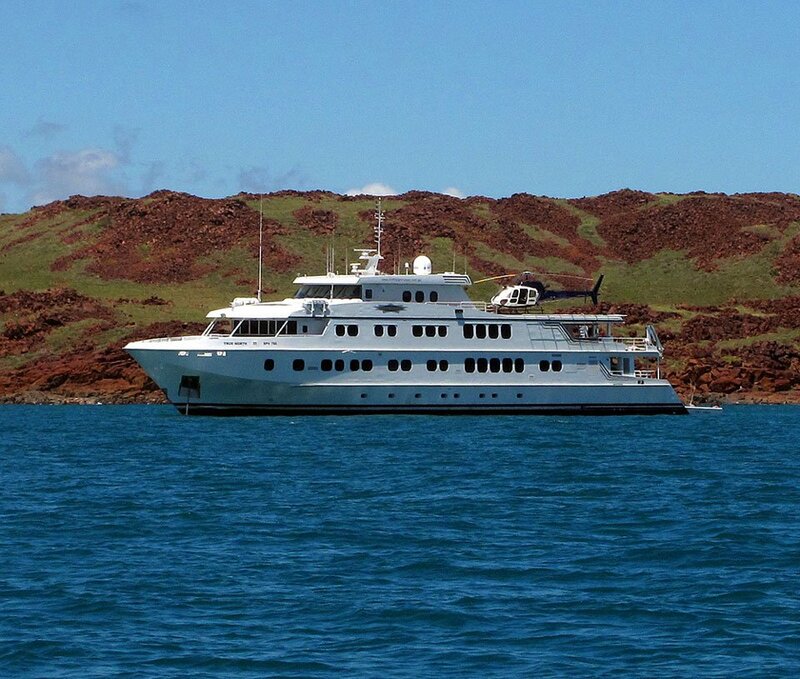 Today we cruise the magnificent Dampier Archipelago. The Archipelago was formed 6000 years ago when coastal plains were flooded by rising sea levels. The area’s rock formations where formed in the Archaean period and are thought to be amongst the oldest on earth. It is a significant place for Indigenous Australians and is well known for rock art and other cultural and ceremonial sites. It is also a place where the endeavours of tens of thousands of years collide with a multi-billion dollar resource industry! Nearby are rich reserves of natural gas, petroleum and iron ore. And our last opportunity for ‘fun in the sun’ lies in this strange twist of bedfellows – such is the interest in this area that much has been done to preserve the conservation and recreation values of the Archipelago. Despite proximity to one of Australia’s largest ports we will find stunning prospects for our now familiar West Coast agenda. Make the most of your last day onboard with nonstop fishing, snorkelling, diving, beachcombing and scenic tender rides! With a vast and remarkable coast now discovered in style, it's time for your early-morning disembarkation and transfer to Karratha. Many, many thanks for yet another fantastic adventure. An extra special thank you for all you did to make my birthday the best ever. I was very surprised by everything – decorated dining room, birthday cake, and most of all the card! You are all very special people and certainly made me feel very special. Bring on the next one! Best regards to all. Fabulous boat, fantastic crew, great guest/fellow passengers, wonderful food, exciting adventures, lots of fun. We have run out of superlatives!